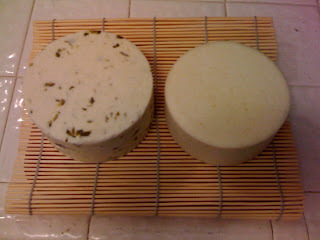 Yesterday my friend Dana and I made a special batch of Stirred-Curd Cheddar. We split it up into a Horseradish Cheddar and a Jalepeno Cheddar. 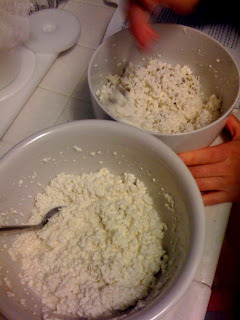 Basically, we followed the Ricki Carroll's Stirred-Curd recipe, and after the faux-cheddaring process (draining the whey, then holding the curds at 100 degrees, stirring every 5 minutes), we then divided the curds into equal parts, adding 2 tablespoons Horseradish puree to half, and 2 tablespoons finely chopped Jalapenos to the other half. The plan was to press both at once (I only have one press, after all). However, we quickly realized that both of these are rather pungent, and that the flavors would likely combine inside the press (even if they're separated by some cheesecloth). We wanted to avoid making a Horseradish Cheddar that tasted like Jalapenos, and vice versa. Even we're not that adventurous! 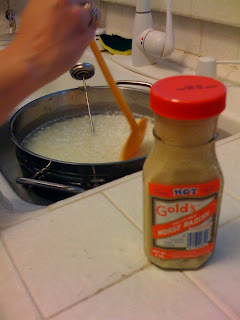 The workaround was to press the Horseradish first, while continuing to hold the Jalapeno curds in the pot at 100 degrees. We pressed at 10 pounds for 10 minutes, then flipped, and again at 30 pounds for 10 minutes. We then switched, holding the shaped horseradish wheel at 100 degress, while we pressed the Jalapeno for the same amounts. Next we stacked the two in the press (each dressed in their own cheesecloth), and pressed at 40 pounds for 2 hours. After that we flipped, redressed, and pressed at 50 pounds. The cheeses are currently still in the press--they'll be ready to take out of the press tonight. Last night I took the cheeses out of the press. Looks like we either pressed the horseradish a bit harder than the jalapeno, or we just didn't divide the curds evenly--the horseradish wheel is quite a bit smaller than the jalapeno wheel. Other than that, they're looking--and smelling--incredible! I'm growing some jalepenos, habaneros, and long red peppers on the balcony. Need some for your next batch!? Yes, of course! Bring it on! Equally important: What Beer will you be making to go with the Habanero Cheddar? I can't tell you how long I have been searching for someone to make a horseradish cheese! Thanks so much for posting this! I am going to try to make a horseradish gouda tonight.